ROBERTSDALE, Ala. – Kyle Irwin had grand plans to finish out his 2018 season and be home in time for the birth of his daughter. He had to alter them in a big way. “When I first found out Randa was pregnant, I developed my plans to have the (National) Finals made by August and be home when the baby comes in mid-September,” said Irwin, a four-time National Finals Rodeo qualifier from Robertsdale, now living in Westville, Fla., with his wife and their two children, Tripp and Ellie. It was a mad dash on the final weekend of the regular season. Several cowboys were on the bubble to qualify for the NFR, and Irwin was one of them. He heads into ProRodeo’s 10-day championship No. 14 in the steer wrestling world standings, having finished the 2018 campaign with $75,333 in earnings. But he was helped out by his baby girl. There were a lot of what-ifs that went into every scenario, because Ellie was due two weeks before she arrived. She showed, too, weighing 10 pounds at birth. “I don’t know who waited, but they waited as long as she could,” he said. “She’s everything we hoped and dreamed for. She’s healthy, she’s happy. Tripp is 22 months old, so the Irwins have to kids under age 2. Maybe a life spent wrestling steers is the perfect training for being a dad. But Irwin has been one of the best for several years. He’s been a regular at ProRodeo’s grand finale for all but one year since 2014 – he spent the 2016 season focused down another path. Once he returned his focus, he’s made sure to play on the sport’s grandest stage, set for Dec. 6-15 in Las Vegas. Even though he trails the world standings leader, Curtis Cassidy, by more than $30,000, Irwin can make up ground quickly in the Nevada desert. Go-round winners earn more than $26,000 per round for 10 December nights, so the money can add up in a hurry. In rodeo, dollars equal points, and the contestants in each event with the most money won at the conclusion of the season are crowned world champions. Irwin knows how special that moment is. A year ago, he was riding right beside Tyler Pearson when Pearson won the Montana Silversmiths gold buckle. Their celebrational hug after the final night of the season was proof of their relationship. But they share even more with Scooter, a 13-year-old sorrel gelding the two co-own and compete on throughout the year. 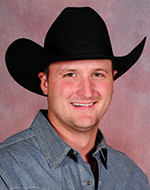 Scooter has been named the AQHA/PRCA Steer Wrestling Horse of the Year each of the past two seasons. Both Pearson and Irwin earn a percentage of what others make when they ride Scooter. That’s why owning the animal is such a valuable resource. “He helped with this new pressure I was in this season, being on the bubble and wanting to be home when my baby was born,” he said. “Worst-case scenario was me not making it to the finals, you’ve still got three guys that made the NFR and are going to ride him. Those are more chances at making money. You’re not guaranteed a check, but Scooter was so crucial. He gave me confidence. Much of that was proven through the season. Irwin didn’t have many big wins, but he found a lot of positives along the way. As a detailed person, he has notes from his previous seasons that reveal his earnings through each month of the season. Every step along the way, he realized he was ahead of where he’d ever been before. There’s still business ahead. The NFR boasts of a $10 million purse, and he wants to get as much of that money as he can. Even though he’s behind 13 other bulldoggers, he knows there are 10 opportunities to cash in. He knows his hands are full. There are 14 other steer wrestlers who have their eyes set on the same prize, that elusive world championship. “Horsepower is crucial out there, and I’m glad we’ve got Scooter,” Irwin said. 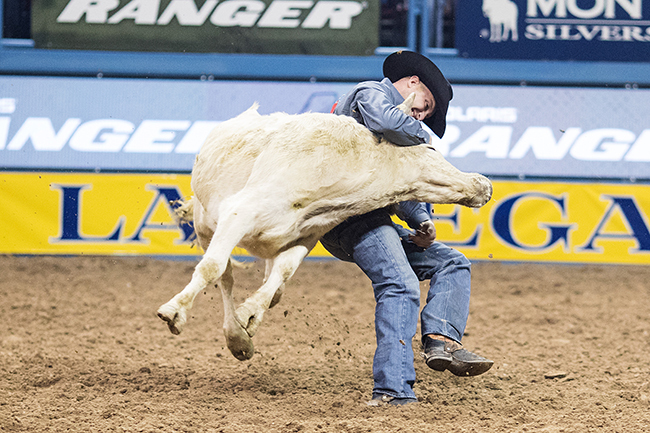 “The thrill of competing at this level makes the steer wrestling spectacular. It’s no different than any other rodeo, but you’re at a level of greatness between 15 guys. There’s no chance of that happening soon. Kyle Irwin is good at what he does, and he loves it. Plus, he’s got a lot of diapers to buy.